First of all, wow. I won the Saveur award! Because of you! Seriously friends, I cannot thank you enough for voting, and for supporting what I do. This achievement means more than you know and I feel more motivated than ever to keep on going. I love this blog and knowing you do too makes every post all the more worthwhile. From the bottom of my heart, thank you. So, I am writing this from 30,000 feet in the air, somewhere high over the Middle East. The digital map on the screen in front of me revealing the names of cities I’ve never even heard of. It feels good to be traveling again in totally unfamiliar territory. We are off to Bali, my family and I. For six weeks we will be living there, tucked away in a rice field somewhere, completely away from the life we know in Copenhagen. We have never been to Asia before, and feeling excited for the adventures that lay ahead. It’s been a dream of mine to visit Bali since I was about 18, and I am sure that my high school self never would have believed that my first time going would be with my husband and baby. In all the years I’ve been traveling, I’ve learned quite a few things about which foods work on the road and those that turn into an unpalatable mess after a few hours outside of the fridge. I’ve also figured out which foods fuel the body in the proper way; nothing too heavy, as I’m sitting for most of the trip after all, and sticking to high protein and carbohydrate-rich foods definitely seem to be best for me. Including fruits and veggies with a high water content is also important, as nothing is more dehydrating than flying. Cucumbers and apples are always high on my list. On today’s menu, I’ve got a pretty wide selection of plant-based delights, all quite simple, but that require a bit of planning ahead. The Black Bean and Quinoa Salad with Cumin-Roasted Carrots is delicious, filling, and travels very well. One thing I cannot stand about plane food is the singular texture (i.e: mush), so that is why my meals always cover the bases with lots of different consistencies: creamy beans, tender carrots, crunchy cabbage, and crispy toasted seeds. I don’t want my mouth getting bored halfway through my dinner, after all. If you are not a fan of cabbage, or you tend to become rather, ahem, windy, form eating it (soooo not awesome on a plane), choose a sturdy leaf that doesn’t cramp your style. Kale would be a good choice, or perhaps romaine. Do not choose a wimpy lettuce that’s going to wilt and goop up the rest of the dish – that would be ever so sad. Although it’s great for a plane ride or road trip, this salad is tasty enough to make the small journey from your kitchen to the dining room table too. If you are going to make it for traveling though, I would suggest keeping the cabbage (or greens) on top of the salad, instead of mixing it in right away. This will help keep the cabbage crisp until you are ready to eat. The Cripsy Seed Flatbreads are actually amazing, but I want to perfect the recipe just a little more before putting it out, so you’ll have to wait just a bit. Deal? Thanks. I also made a really simple hummus for the trip, because dipping is fun no matter what altitude you’re at. I have been on a bit of a curry kick lately, so curried hummus is was – but feel free to toss in any spice mix you have, or just kick it classic style it with cumin. I do remember saying that curry was a no-no in my previous travel post, but I kept things pretty mild since I knew I’d be on a plane rubbing shoulders with unappreciative co-passengers. My biggest piece of advice for getting any dip through security is to keep things thick. If your hummus is runny at all, or resembles “paste” they may confiscate it (and be prepared to throw out your container too if this happens). 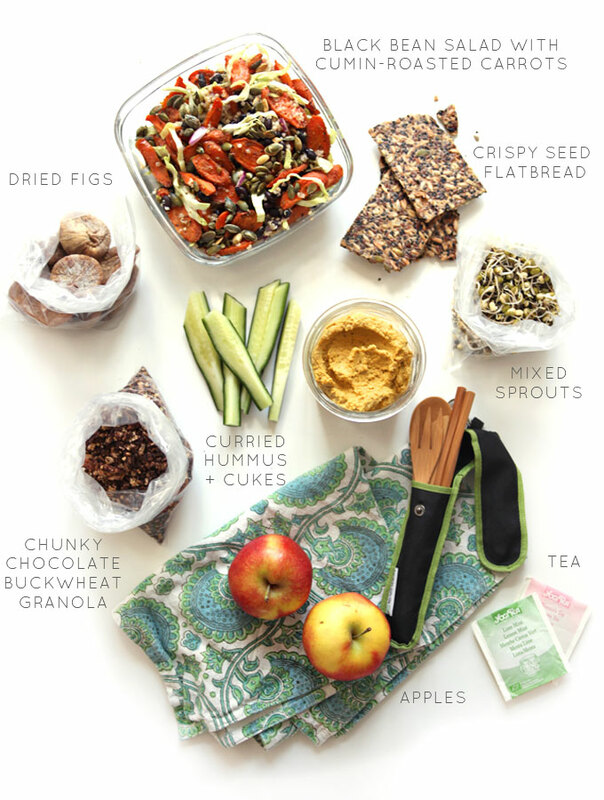 It can help to actually put the veggie sticks into the Tupperware with the dip itself, so the discerning agents can get a handle on the fact that you’re just an über-prepared foodie. Prepare the salad and hummus well in advance of leaving for your trip – the day before is ideal. You need to make sure all the ingredients are cool before you make both dishes, so that they will keep for many hours outside of the fridge. If they are warm when you leave, they may spoil en route. If you want lots more travel tips, check out my post from last year which discuses everything from avoiding jet-lag to how to make a thoughtful homecoming for yourself. Happy trails! 1. Cook black beans and quinoa. Let cool completely. 2. Preheat oven to 400°F / 200°C. Wash and remove tops from carrots (leave the skin on). Slice however you like, ensuring that they are relatively the same size so that they cook evenly. In a mortar and pestle roughly grind cumin seeds. Toss carrots with oil, maple syrup, a few pinches of salt and the cumin. Place on a baking sheet and roast in the oven until tender and fragrant, 15-20 minutes. 3. While the carrots are roasting, prepare the rest of the salad. Whisk dressing ingredients together in the bottom of your travel container, then add the cooled quinoa and black beans, folding to coat. Slice red onion and cabbage and add to the top, along with the carrots. 4. In a dry skillet over medium heat, toast pumpkin seeds until they begin to pop. Remove from heat and let cool slightly. Add to salad. 1. Cook chickpeas if using dried. Let cool completely. Canned is fine. 2. In a food processor pulse peeled garlic cloves until minced. Add all other ingredients, except chickpeas and blend until you have a thick paste. Add chickpeas and blend on high until smooth, adding water to thin as you desire (remember to keep it rather thick so it makes it through security!). Season to taste. Store in a container in the fridge until you leave the house. Although my time in Bali is most definitely a holiday, I’ll still be blogging (can’t help myself!) and on Instagram, where you can follow my culinary adventures. Good grief, I cannot wait to EAT! I hope the island is prepared for me and my hollow leg. If any of you have been to Bali, I’m totally up for advice, tips, recommendations on stuff to do, where to eat, etc. Let me know in the comments, and thank you in advance! Until the next post, here’s to flying high with happy meals. …and because I know someone will ask, my bamboo travel utensil set is made by To-Go Ware. popping it upp all over the web without my agreement. Do you know any ways to help reduce content from being riped off? Congradulation on your award! Your blog is amazing, I really enjoy trying out your recipes – I life the fact that you often use vegetables that grow in my local area which makes it alot easier when I am out of inspiration as the veggies come and go through seasons. I just made black beans & carrot salad for lunch. Such a satisfying meal and taste is amazing. This salad is also great for picnic/brunch outdoors. Thank you for the recipe! Please post the recipe for the Crispy Seed Flatbread, even if not perfect! It looks so delicious! Congratulations! How exciting to be named a best food blog! You are such an inspiration. Looking forward to more great things. Enjoy your trip! I’ve been following your food adventures on instagram, but I’m pleased to hear you plan to keep on blogging too! Your plane food looks amazing. Bali! Yeah! And congratulations as well for your blog! I am so glad to see these travel recipes. I travel a ton and have a hard time with airplane food. Actually, I’m going to make these dishes for this week’s regular meals at home. Have an awesome time in Bali! I have discovered your beautiful website a few months ago and I have most of the recipe I read and I must tell you it always worked! My almost 4 years daughter is crazy about many of them but the black beans cookies rock it, we do the recipe together and she actually see this is dry black been which she doesn’t care she has no prejudice. Thank you so much, I also must add that despite the fact that I have no intention to become a vegetarian or a vegan, with all the great and creative recipes around I often do not eat any during weeks, I don’t miss it I just love good food! owe the baոk and the student loan corporations your life. Have so much fun on Bali! I would love to go too since I was 18. Traveling is the best and kudos to you that you do it with a 5 Month old, a lot of people limit themselves not to, which is sad. I loved your last post on travel food as well as this one. I used your tips on my 27 hour flight to Tahiti. Looking forward to some Bali inspired recipes! Lovely, lovely post. Cannot wait to see the recipe for the flatbread, and I’m bookmarking the Chunky Chocolate Buckwheat Granola as I type. Enjoy Bali! love this post! i’m going to europe in may, so i’ll make your recipes for sure. the salad looks sooo good. What a great post! The carrot salad looks absolutely gorgeous, can’t wait to try it next time I’m traveling. The rice and beet salad from your first healthy traveling post is actually something I find myself coming back to often; in fact, I prepared it for a road trip with my family just last Friday. Oh, and I’ve been meaning to ask where you got those containers from? Hope you have an amazing time in Bali. Safe travels!